Damascus – Caretaker Deputy Prime Minister, Foreign and Expatriates Minister Walid al-Moallem, said that Syria is prepared to cooperate and coordinate on the regional and international levels to combat terrorism as per Security Council resolution no. 2170 within the framework of respecting Syria’s sovereignty and independence.In a press conference on Monday, al-Moallem said that cooperation should be carried out through the Syrian government which is a symbol of national sovereignty, and this complies with the first article in the resolution which does not authorize anyone to act alone against any country,, asserting the Syrian government’s readiness for regional and international cooperation either via an international or regional coalition or bilateral cooperation with those who want, as long as this cooperation is approached in a serious manner without double standards, because it makes no sense for there to be tireless efforts to weaken Syria, besiege it economically, and besiege its army which is confronting the Islamic State of Iraq and Syria (ISIS) and Jabhat al-Nusra terrorist organization on Syrian soil at the same time when others claim to be combating terrorism, asserting that any breach of Syrian sovereignty by any side constitutes an act of aggression. He stressed that air raids alone will not eliminate ISIS or Jabhat al-Nusra, and that before that the sources of terrorism must be dried up and neighboring countries must commit to controlling their borders, exchange security information with the Syrian government, and stop arming and funding terrorists.“Being serious in combating terrorism isn’t achieved by transgressing against others’ sovereignty; it is achieved through serious political work to dry up its sources and cooperating with the Syrian government, because we know better than anyone else what is happening on our land, then comes international joint action to combat terrorism,” al-Moallem said. The Minister said that Syria welcomes resolution no. 2170 and is committed to it, despite the fact that this decision came late, noting that the consensus at the Security Council on combating terrorism is in line with Syria’s calls for drying up the sources of terrorism and for stopping the funding, training, arming, harboring, and smuggling of terrorists through borders with neighboring countries. He noted that Syria had warned against the threats which result from supporting terrorism, and that it warned against the possibility of terrorism spreading to neighboring countries and beyond, but nobody listened until the resolution was issued. 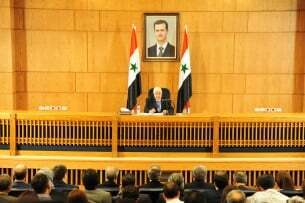 Al-Moallem said that Syria hopes that all countries will commit to the Security Council resolution which came under Chapter Seven and is binding for all sides, welcoming all those who commit to it, adding that the most significant thing about this resolution is that it reaffirms previous resolutions on counter-terrorism and reasserts the independence, sovereignty, unity, and territorial integrity of Iraq and Syria , in addition to respecting the UN Charter and principles of respecting national sovereignty and independence, reiterating that terrorism in all its forms and aspects constitutes one of the gravest threats to international peace and security, and affirming that all acts of terrorism are criminal acts that are unjustified no matter the motivation behind them and regardless of when they were committed or by whom. The Minister went on to say that the resolution stressed that terrorism can only be combated through perseverance, comprehensiveness, and the efforts of all countries and international and regional organizations through active coordination to curb, isolate, and neutralize terrorist threats. He added that there are other points to consider in the resolution that confirm the correctness of Syria’s position, as the resolution states that even the instigation of terrorism and terrorist mentality must be prevented and its exporters – who are well known – must be stopped, along with addressing the basis on which the mentality of ISIS and Jabhat al-Nusra terrorist organizations are built. 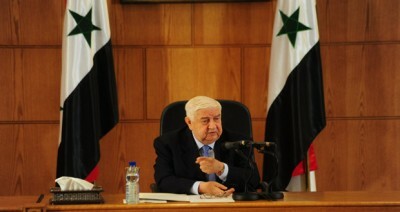 Al-Moallem said that there are several articles in the resolution which discuss preventing the funding of terrorists and stopping the importation of foreign fighters who are sent across borders to Syria and Iraq, as well as stopping harmful activities in educational, cultural, and religious establishments, stressing that this resolution is binding for all Security Council members. “The question that poses itself today is, after the resolution was issued on August 15th and today we’re near the end of the month, did we see a real and serious international movement to implement this resolution?” he asked. Al-Moallem noted that a week ago, Washington Post published an interview with an ISIS leader in which he said that the cooperation between ISIS and Turkey is strong, and that when they go to Turkey they “roll out the red carpet” for them and treat their wounded. “Does this come within the framework of Security Council resolution no. 2170?” Al-Moallem wondered. The Minister said that a U.S. journalist abducted by Jabhat al-Nusra was released a day ago, and Syria welcomes his release, but a statement was issued by the Qatari foreign ministry claiming that Qatari efforts led to his release, which leads to the conclusion that these efforts were linked to Jabhat al-Nusra, adding that a German minister also made a statement recently in which he said that Germany has information indicating that Qatar funds Jabhat al-Nusra. Al-Moallem said that any counterterrorism effort must be done through coordination with the Syrian government which represents sovereignty, and that Syria now is holding the international community responsible for implementing the Security Council resolution, adding that Syria wants to see true commitment to implementing it by all countries, particularly those neighboring Syria, and this position will form the basis of the actions of Syrian diplomacy in the coming stage. Responding to a question on what Syria is expecting now from the west which it has accused repeatedly of encouraging terrorism, al-Moallem said that Syria judges tangible actions, and that Syria has documents on who is arming and funding terrorists in Syria and therefore Syria’s political and media positions reflected that, and these positions will remain the same until the west proves otherwise through an actual shift, not in words but in actions. On how serious western countries are about combating terrorism, al-Moallem said the coming days will judge how serious countries are about combating terrorism and implementing the Security Council resolution, something which is yet to be seen, noting that the idea of classifying terrorists as “moderate” and “non moderate” is laughable, as all those who bear arms against the Syrian state are terrorists, and all those who murder an innocent Syrian citizen –whether that citizen is a civilian or a member of the armed forces – are terrorists. 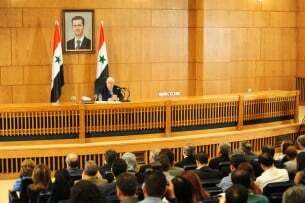 Al-Moallem said that the Syrian Foreign and Expatriates Ministry sent documents to the Security Council on including the Islamic Front in the list of terrorist organization, because it cooperates with ISIS and Jabhat al-Nusra and therefore they’re on the same page, asserting that the Ministry will continue documenting the crimes of the Islamic Front in order to include this organization in the resolution. “The Islamic Front, whether it is located in Ersal in Lebanon or in the south of Syria or in Aleppo, is cooperating with Jabhat al-Nusra,” he asserted, noting that the Islamic Front recently captured gunmen from another armed groups who were affiliated with it because they were about to become involved in national reconciliation. On what happened recently in al-Tabqa military airport, al-Moallem said that the Armed Forces defended the airport valiantly against three waves of attacks by ISIS terrorists, killing hundreds of terrorist, but the military command, out of concern over soldiers’ lives, withdrew them to nearby sites along with their equipment and airplanes and evacuated the base and all its contents, which is something that could happen in any military operation. On coordination between Syria and the west, al-Moallem said that this coordination hasn’t started yet so it’s impossible to tell where it will lead, saying that had the international community been committed to previous Security Council resolutions on counterterrorism, then the situation wouldn’t have reached its current state, adding that the limits of cooperation depend on international sides and this issue will be approached according to Syrian national interests. “Syria proposed coordination and cooperation with everyone, and the goal of this is to prevent any aggression or misunderstanding, because Syria has air defense systems, and if there’s no coordination, we may reach the point of using them,” the Minister explained. Regarding the execution of U.S. journalist James Foley by ISIS, al-Moallem denounced this crime in the strongest term and denounced the killing of any innocent civilian. However, the Minister wondered why there hasn’t been any western condemnation of the massacres committed by the Islamic State of Iraq and Syria (ISIS) terrorist organization against the Syrian army and citizens, despite the fact that dozens of these massacres were committed. On the recent meeting of the Arab members of the so-called “Friends of Syria” and the possibility of a shift in Arab positions regarding Syria, al-Moallem said that the five aforementioned members didn’t issue a statement following their meeting in Jeddah; rather there were only media commentary on them disagreeing or agreeing. He stressed that if the goal of this meeting was to find a political solution for the crisis in Syria, then such a solution can only be achieved via inter-Syrian dialogue which is led by Syria and held on Syrian soil. “What comes out of this dialogue is what will be implemented, and at that point, everyone must respect the will of the Syrian people as expressed by ballot boxes,” he added. Regarding recent Saudi fatwas and whether they constitute the beginning a shift in Saudi positions at a time when western press is saying that ISIS is purely a Qatari product, al-Moallem said that any positive position is welcome, and if Saudi Arabia views such positions as being in line with its interests, then there are no conflict of interests, adding that any effort that reduces the effect of Wahabi mentality anywhere and any act that holds those who fight alongside terrorists in Syria accountable are a good thing. On whether the recent visit of the Iranian Foreign Minister to Saudi Arabia will lead to a shift in Saudi positions, al-Moallem said that he doesn’t believe that it would. On whether there was a Syrian-Russian coordination regarding the Security Council resolution, the Minister said that the Syrian and Russian positions on combating terrorism are in total concordance, underlining the importance of Russia’s efforts to achieve regional and international cooperation to combat terrorism, adding that he and Russian counterpart Sergey Lavrov discussed the resolution at length over the phone, and that this is part of the constant coordination between the two countries’ foreign ministries. On whether Syria could ask the Russian government to carry out military strikes against ISIS sites, al-Moallem said that Syria made no such requests, but that there’s an ongoing economic and military cooperation and political consultation with Russia, but this hasn’t reached the point of asking for Russian airstrikes on ISIS sites which hasn’t happened. Regarding the need for Syria, Iran, Russia, and Iraq to have a strong position and plan and unify efforts to hold ISIS in check, al-Moallem said that there’s coordination between these four sides on almost daily basis, and that these four countries constitute the first line of defense against terrorism, noting that ISIS and Jabhat al-Nusra are far more dangerous than Taliban or Al Qaeda in Afghanistan ever were. “The United States and the NATO have been fighting there for over than years under the slogan of combating terrorism, so how could they weaken Syria and its armed forces then say that they want to fight terrorism? These are the double standards I was talking about,” he said. On the recent political developments in Iraq, al-Moallem said that the Syrian government had strong relations with the government of Nouri al-Maliki and that Syria believes his acceptance of Haidar Abadi being tasked with heading the new government is a commendable position, asserting that Syria will continue to cooperate with the new Iraqi government, hoping that it will see light soon. “Cooperation between us and Iraq, whether we want to or not, is not a policy to adopt; we’re fighting a common enemy and are in the same trench against it, so coordination and cooperation between the two governments is required and necessary for the interests of the two countries’ people,” he elaborated. Regarding Turkey’s regional relations, the Minister said that currently, Turkey’s relations with its neighbors have hit rock bottom, and that Turkish policies towards events in the region must change for the sake of the Turkish people’s interests for the sake of Turkish security, because terrorist organizations know no borders or homeland or religion, adding that Turkey’s borders with Syria extend along 850 kilometers, not to mention its borders with Iraq, and the terrorist groups in question are active on these borders. Al-Moallem said that the victory of Recep Tayyip Erdogan in the Turkish presidential elections and the debate on the performance of the Turkish opposition is purely a Turkish issue with which Syria does not concern itself, and the same goes for the appointment of the Turkish prime minister. The Minister said that the past few weeks witnessed rapid and dangerous developments, with infighting in Libya which the international community is observing idly, in addition to what is happening in Yemen, not to mention that we’ve reached the 50th day of the ongoing Israeli aggression on the people of Gaza, which the Arab world and the international community are watching without taking any action to stop the Israeli massacres and bloodshed against the Palestinian people.